All of the money Barbara Hill poured into remodeling her 1960s condo in Houston was spent taking things out?and she couldn?t be happier. 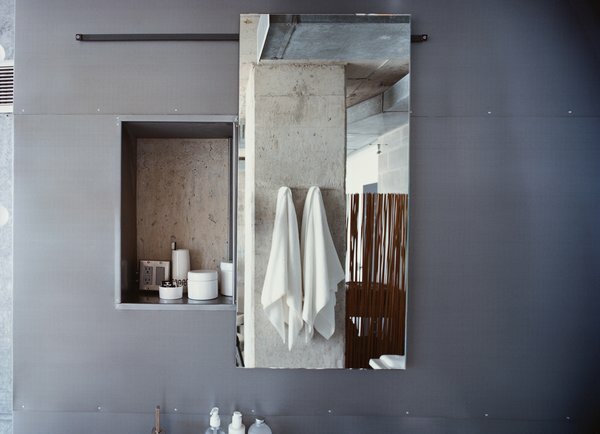 For some architects, minimalism is about sleek surfaces that cost a fortune to achieve. But to Barbara Hill minimalism means living with the blemishes that remain once she?s stripped the sleek surfaces away. 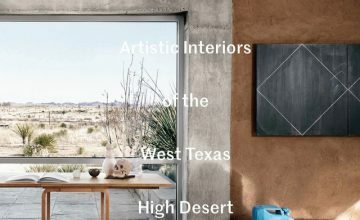 The raw concrete of Hill?s apartment, she notes, is anything but plain: The mottled gray surfaces evoke both the mountains near her weekend house in Marfa, Texas, and the work of minimalist artists, which she began selling more than 30 years ago. In a ceiling with rust stains and nail holes, Hill sees the natural and the man-made in beautiful profusion. 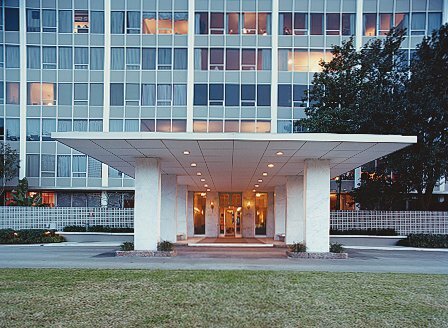 The exterior of Hill’s Houston building, constructed in the 1960s. The words of the prophets are written on the chalkboard-paint-coated door to Hill’s apartment. 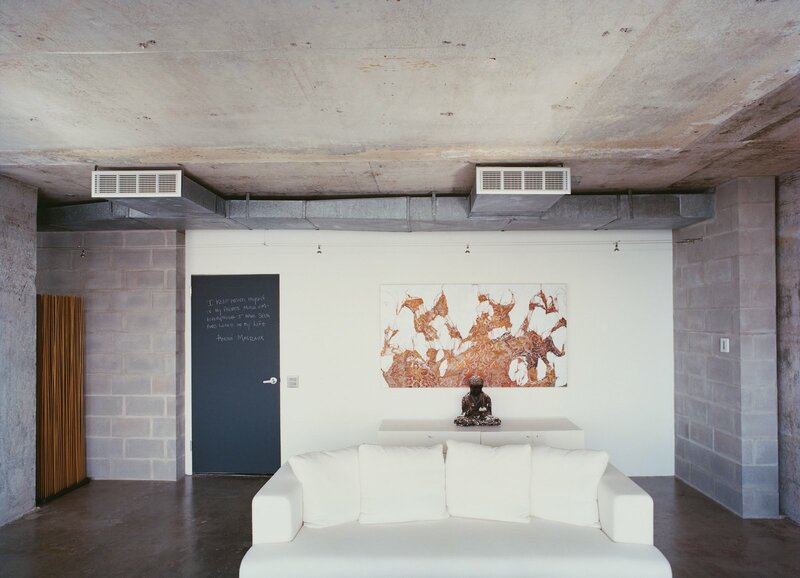 A painting by Mark Flood hangs behind a plaster Buddha on a chest from Cassina. The Ligne Roset cotten sofa was bought on sale. Hill, who was born in Beaumont and crowned Miss Texas in 1956, is an expert in both conventional and unconventional beauty. She has lived ?with every style you can think of,? but some of her fondest memories are of the 1970s, when she turned her Houston house into a gallery, representing artists such as Daniel Buren and Sol LeWitt early in their careers. ?Minimalism is where my heart is,? she says. 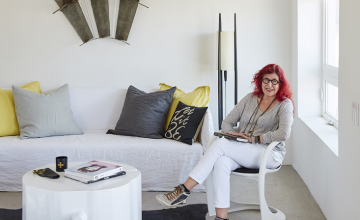 So when she moved back to Houston a few years ago to be near her four children and seven grandchildren, she was determined to create an environment that left room for people and just a few objects. 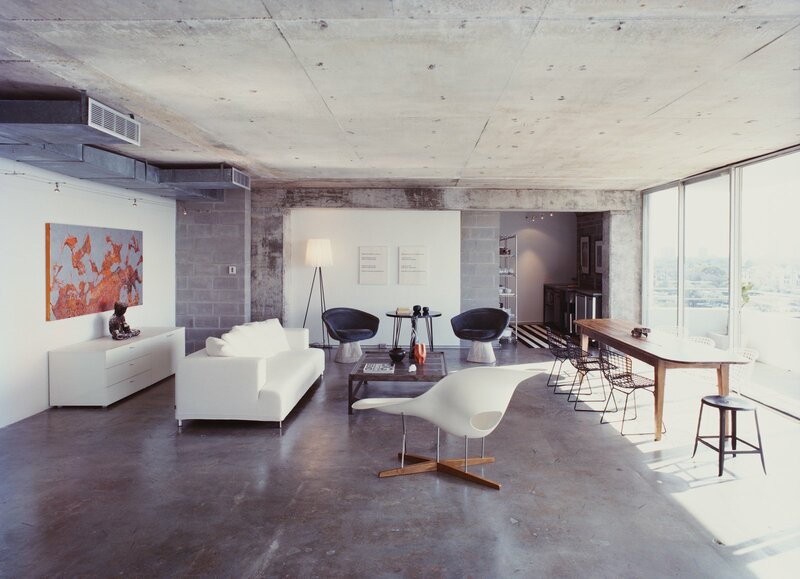 A Philippe Starck standing lamp and an Eames chaise longue bracket the living room; two Lawrence Weiner prints hang behind a pair of Warren Platner chairs and a table purchased from a River Oaks estate sale; at far left of the room, a partial wall of new cinderblocks hides a return air vent. She chose a condominium in a 1960s building, largely for the sunset views from its southwest-facing terrace. Its 850 square feet provided enough space, but little within that space was worth keeping. ?It was a bachelor pad,? she says, with walls of mirrors, a white gold-trimmed Corian bar, and an entertainment center reminiscent of another Houston landmark: NASA?s mission control. 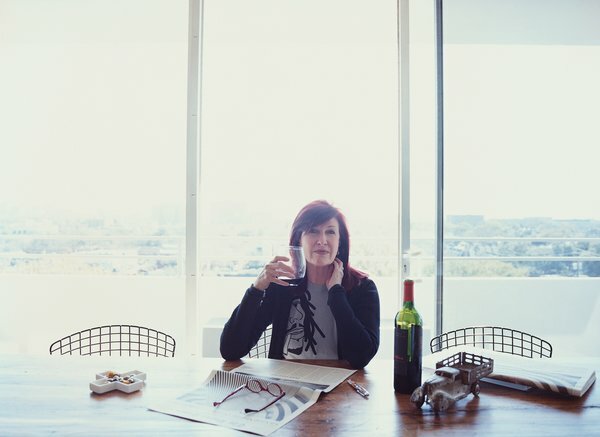 Hill lived downstairs in a borrowed apartment during the construction process, ascending each morning in her pajamas to watch workers tear things out?often after a 7 a.m. consultation with her contractor, Brent McCaleb, and designer friend Carol Zimmermann, who both live in the building. ?Demolition is always the most fun part,? Hill says. Soon she was down to concrete floors, a concrete ceiling, and dark gray concrete block walls?and loving it. She says, ?Once I saw the exposed space, I couldn?t bear to put anything back.? The door to Hill’s medicine cabinet, made by George Sacaris, slides open to reveal a concrete wall. 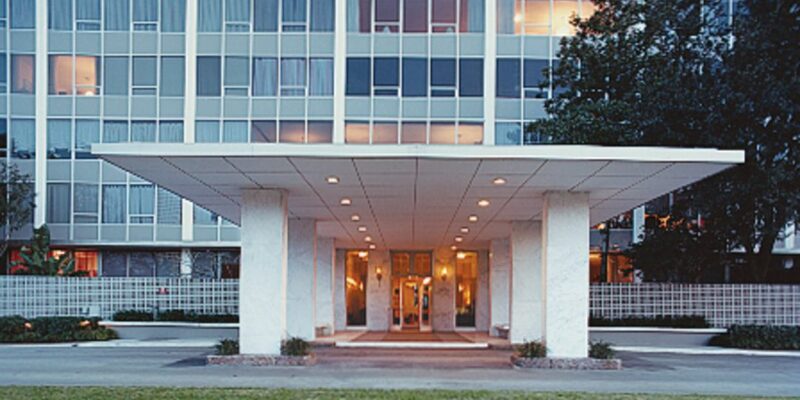 With bright red hair, Hill is a standout in a gray-glass 1960s building. Her coffee table is a French mail-sorting table with the legs cut down. That includes a bathroom wall. ?I could have had a normal closet, a normal bedroom, and a separate bathroom,? she explains. ?But it isn?t what I wanted.? She adds, ?I haven?t had any complaints. If people think it?s odd, they?re too polite to tell me.? 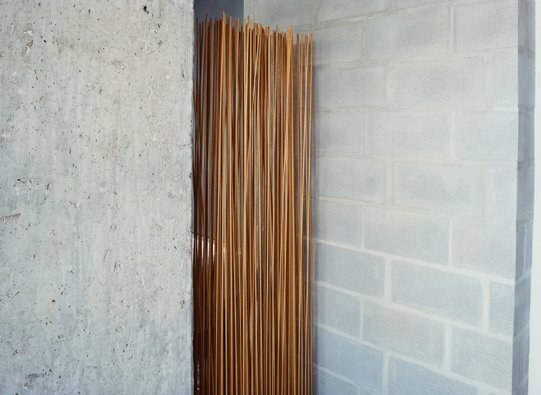 A room divider by Extremis, made of sticks protruding from a rubber base, shields the bathroom. Who needs shelves when there’s plenty of floor space? 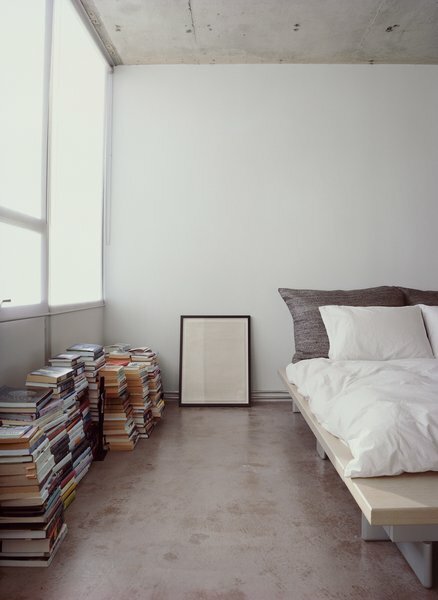 Stacks of books and a framed print sit alongside a Peter Maly Ligne Roset bed, reupholstered in stiff linen. What Hill did put back, she put back sparingly, in her own way. 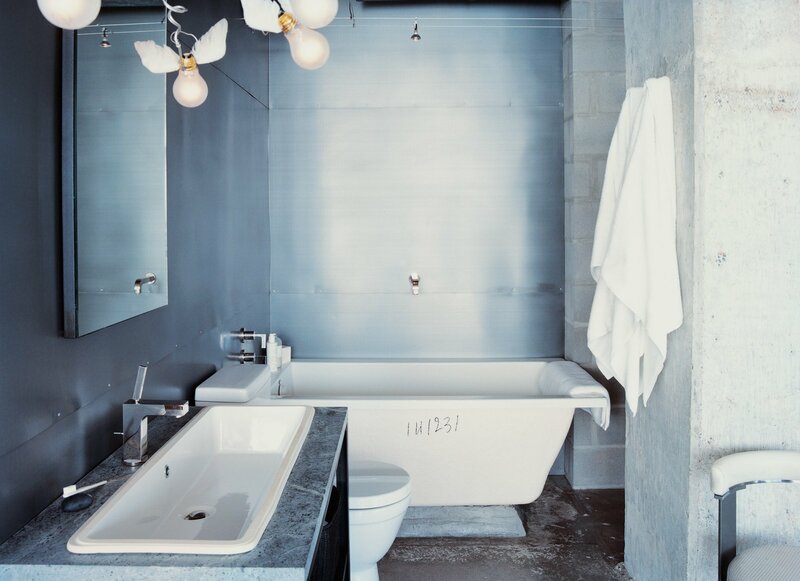 The bathtub, designed to be set into a tile enclosure, was left bare to expose a rough exterior and surrounded by walls of zinc sheeting traditionally used for roofing. The sink, designed to be undermounted, was overmounted to expose its similarly unfinished edge. The door to the apartment (which doubles as a blackboard) opens alongside the bathroom?a problem Hill solved with a room divider made from wooden sticks set in a rubber base. A piece of bamboo ?carpet,? standing on end, serves to partially hide the closet. Hill at her dining room table. 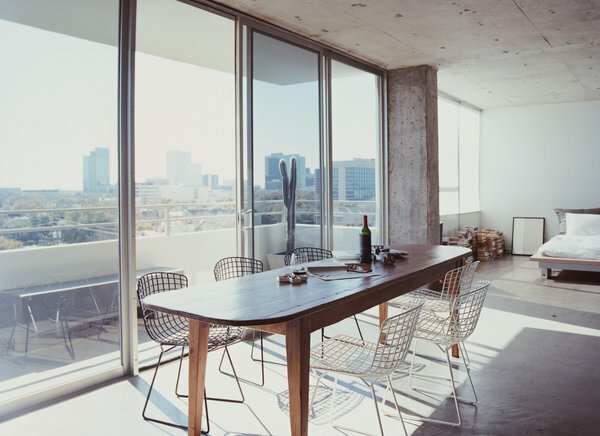 There used to be walls; now Barbara Hill’s bed offers views not just of Houston, but also a French farm table surrounded by a sextet of black and white Harry Bertoia chairs for Knoll. And then there?s a hanging light fixture by the German master Ingo Maurer: a bit of razzle-dazzle that delights and distracts the eye. ?A real minimalist wouldn?t have that,? Hill says of the piece, entitled ?Birdie,? adding, ?My approach is minimalism with juice.? In Hill’s kitchen, exposed pipes behind the counter have plenty of company: the pipes that form her storage units. The rug, by Chilewich, is made of vinyl. 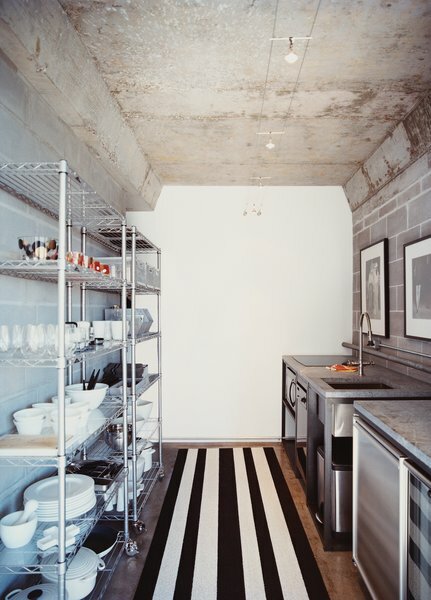 In Hill?s kitchen, appliances?including a 24-inch undercounter refrigerator, a 15-inch dishwasher, and a microwave convection oven?are set into custom steel frames topped with soapstone, to bring softness to the hard-edged composition. Storage is open wire shelving? which, says Hill, ?forces you to get rid of things you don?t really need.? The gray walls are optimal for hanging her extensive art collection that is both discerning and quirky: She lined a wall with photographs of rear ends, she says, ?to give the place a sense of humor.? But Hill?s approach isn?t entirely subtractive?she covered the floors in a water-based sealant and built a couple of concrete block walls. One of those walls is set, ingeniously, three inches from an existing concrete column, creating a narrow vertical slit that serves as a return air vent. The gap reads as a simple dark line, far less obtrusive than the usual metal grille, which Hill says is something she ?didn?t want to look at.? When it came time to furnish the space, Hill bought some pieces for pocket change at estate sales in River Oaks, a wealthy Houston neighborhood where mid-century houses are slowly being supplanted by McMansions. Others, like the French mail-sorting table she uses as a coffee table, came from bona fide antique stores. Even new pieces are tweaked to Hill?s tastes, like a Peter Maly platform bed from Ligne Roset, reupholstered in stiff linen to replace the softer standard cushions. 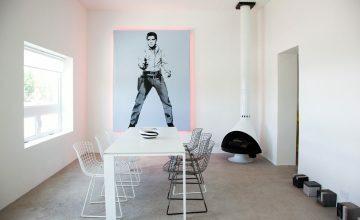 Perhaps her most dramatic piece of furniture is the swooping white fiberglass chaise by Charles and Ray Eames, which Hill likes to see through the eyes of one of her grandsons. ?He has pretended it was a snow-capped mountain, a ship, a wave. We?ve played all kinds of games on it.? When one of those games added some scratches to the piece, Hill says, unflinchingly, ?It became that much more valuable to me.? When she isn?t playing with her grandkids, Hill is a consulting designer for clients who aren?t afraid of her improvisational approach. ?You don?t know what you?re going to find until you open up the walls,? she says, shrugging. ?I don?t do sketches.? What she does do is bring a refined sense of style and a spirit worth emulating. ?When you have less stuff around,? Hill says, ?I think you can feel more expansive. ?